JWT Shanghai has won a Gold Outdoor Lion for “Samsonite Heaven and Hell”, a print and outdoor advertisement for the Samsonite Cosmolite suitcase. The selling point is it’s ultra-durability. The billboard demonstrates the vivid contrast between how “heavenly” it is in first class for the passenger but “hellish” down below where the suitcase is being handled. And yet the suitcase emerges sparkling after the torture. Click on the image below to see the bigger picture. The campaign won Grand Prix for Press and Gold Lion for Outdoor at Cannes International Festival of Creativity. 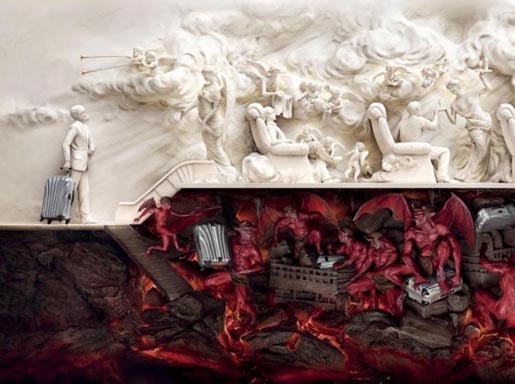 The Heaven and Hell campaign was developed at JWT Shanghai, China, by executive creative directors Yang Yeo and Elvis Chau, creative director/art directors Hattie Cheung and Rojana Chuasakul, art directors Haoxi Lv, Danny Li and Surachai Puthikulangkura, copywriter Marc Wong, account supervisors Sophia Ng and Lily Zheng. The billboard was produced at Illusion Co., Bangkok, by producers Anotai Panmongkol and Somsak Pairew, illustrators Surachai Puthikulangkura and Supachai U-Rairat, producers Joseph Yu, Lulu Zhang and Isaac Xu.